★ The next prayer time is highlighted to easily alert & catch the next prayer. ★ Current time and remaining time for the next prayer is mentioned to help you prepare for the prayer in time. ★ Easily turn Adhan alarm On/Off for any Salah with a single touch. 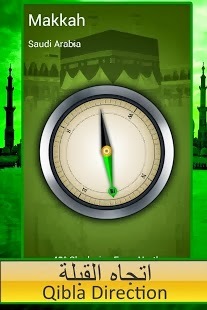 ★ Digital magnetic Compass using your phone/tablet sensor will quickly point to the Qiblah direction. ★ Almost all major cities around the world are covered. If your city is not listed, select the nearest one. ★ You can change the Azan voice or record your own Athan in your voice . ★ Best Islamic tool for every Muslim to follow his daily Solat (namaz) in home or Masjid and make Doaa for us.